Last night, on my way to the reconvened Planning Applications Committee (PAC), I bumped into a group of residents walking along Hammersmith’s riverfront. They were heading there too. “It’s a done deal isn’t it Steve?" One asked, referring to St. George's Hammersmith Embankment scheme. “I think so” I responded. “I’m expecting to see my councillors ask their officials some planted questions - ones that are helpful the developer” said the Fulham Reach ward resident. “Sadly, I think you may be right” I replied. About an hour later and well into the PAC meeting, Fulham Reach ward Councillor Andrew Johnson (Con) indicated he wanted to speak. And, with a straight face, he asked the bicycling expert amongst the council officers “Would you possibly have any information comparing bicycle traffic studies of this development and the previous Goodman’s office block?" Adding with faux wonderment “I suspect this scheme might be marginally better?"... Surprise, surprise: the officer had that info and Cllr. Johnson’s suspicions were proved correct. The audience burst out laughing. “Do you think we're stupid?” shouted one member of the 120 strong crowd,"That was clearly a planted question." Cllr. Johnson didn’t respond. So was it a done deal? All six of the Conservative members of PAC (including the Fulham Reach ward councillors) voted as a block and approved the scheme - but why? It was bigger than anything else in the neighbourhood, it flouted the council’s rules on density, affordable housing and the conservation area and is going to blight the Hammersmith riverside with some pretty horrible buildings. Cllr. Alex Karmel (Con) then poured scorn on the Queen Caroline Residents Association. Their apparent sin was to mention in their objection letter how they were concerned about loss of daylight. "How far away is Queen Caroline Street?" asked Cllr. Karmel - winding up all the members of that residents group that had taken the trouble to attend. One resident spoke up in defence, "We are concerned about the loss of daylight for our friends and neighbours in Chancellors Road" he said. "We don't just care about ourselves!" The Conservatives looked confused. Labour’s PAC members are Councillors Colin Aherne, Mike Cartwright and Wesley Harcourt. They asked questions about all this scheme’s obvious flouts of the Council’s and London Mayor’s planning guidelines - the audience loudly applauding each of their direct hits. But the Conservative members smirked and carried on – giving the impression that they knew the outcome because they had the majority vote. Residents wanted to know about the all too cosy relationship H&F’s Conservative Administration had with St. George, the developer. The Council had acquiesced to St. George’s request to change their highly influential Core Strategy. That meant the obstacles stopping St. George buildings a block of flats on the Hammersmith Embankment higher than six stories were removed. The Conservative Administration did this despite St. George being the only people to request it and every single resident association in the area arguing against that. No one in the Administration gave a satisfactory explanation. One explanation being put by residents was that the Conservative Administration had unlawfully sold the planning approval for a £13 million Section 106 Agreement. Could that be true? I had written to the Director of the Environment on the 12th August and asked about the many meetings that Conservative Councillors and Senior Council Officials had with St. George. I asked him to tell me when these took place, who was in the meetings and what was agreed? I knew that the meetings had begun prior to St. George buying the Hammersmith Embankment site and had also included discussion about the Riverside Studios and Queens Wharf – which are within 100 metres of the Hammersmith Embankment site. The Director of the Environment wrote back to me to say there has been “a very large number of meetings between representatives of the Council and the Berkley Homes Group (including St George) over the past three years” and these were about a number of schemes across the Borough. He admitted, “many but not necessarily all of which will have involved officers in my department, and indeed myself” but refused to let me know the details of this specific scheme because he believed it would be “extremely onerous and time-consuming to gather all the information you have requested” and that under the "Wednesbury" rules I would have to detail why I needed that information. I wrote to him again on the 22nd August detailing why but still no satisfaction. I therefore wrote to the Council’s Chief Executive on the 8th September detailing more concerns and asked him to investigate what meetings had occurred, who attended these meetings and what was agreed. By 14th September the Chief Exec hadn’t got back to me. 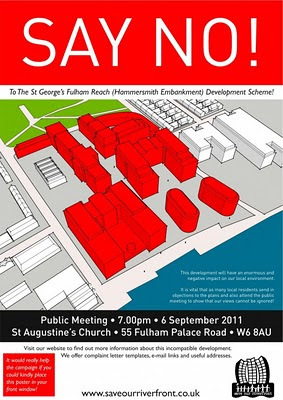 The St. George’s scheme was scheduled to be discussed (and as it later turned out agreed) that night. So both Cllr. Mike Cartwright (Lab) and I wrote Cllr. Alex Chalk (Con) the Chair of the Planning Committee to ask him to get the answers to those questions. Councillors Cartwright and Chalk are both PAC members so are entitled to this information under the “Wednesbury” rules. At 32 seconds past 5.00pm last night I got a vague response from the CEO. It was sixteen days since I had written to him but his email said he needed more time to investigate but he thought I could get my concerns addressed at the PAC meeting - which would still be allowed to go ahead. Cllr Chalk had not responded to my concerns either. By the start of last night’s PAC meeting the only email I had from Cllr. Chalk was one saying that he had decided to deny me the chance to speak at the PAC meeting. This would have been a break in the convention that accepted ward councillors could speak on matters that affected their constituents or were in their ward. My constituents in Chancellors Road had asked me to ask about this development. It was about two metres from their homes, would block their light, cause disruption from traffic, parking and building works. I spoke anyway. I said that the audience should be told that the vague, misleading photos the committee were being shown was from St. George not the Council. I asked about the committee’s knowledge of a deal St. George had offered the Conservative Administration that it could either have affordable housing or £13 million; I asked if Cllr. Andrew Johnson, who is also the Cabinet Member for Housing, had been involved in this housing deal and why Cllr. Chalk had failed to follow up on my concerns sent to him ten days earlier. Cllr. Chalk refused to answer any of these questions and suspended the meeting. I spoke to him in the interlude and again raised the seriousness of my concerns. On return, Cllr. Johnson spoke first and said that he had not been involved in any of the agreements made between the Administration and St. George. He said he had behaved properly and in line with the strict PAC rules. I believed him. Cllr. Chalk called me to speak next so I made all my points again and asked who in the Conservative Administration had agreed the £13 million deal? Still no answer. The Committee moved to a vote. All three Labour councillors voted against. A resident came up to me at the end, “So what happens if the Council did act improperly. Does that void this planning approval?” he asked. The answer is sadly not. It would get the Council into serious trouble but the approval stands. St. George’s diggers are expected on site within the month.